No component of graphic design has attracted as much interest or inspired as much innovation in recent years as lettering and type. These fundamentals of design, once the exclusive domain of professional typographers, have become an essential starting point for anyone looking for a fresh way to communicate. Practical information about creating letters and type often amounts to a series of guidelines for executing a particular process, font program, or style. But what makes lettering and type endlessly fascinating is the flexibility to interpret and sometimes even break these rules. Lettering & Type is a smart-but- not-dense guide to creating and bending letters to one's will. More than just another pretty survey, it is a powerful how-to book full of relevant theory, history, explanatory diagrams, and exercises. While other type design books get hung up on the technical and technological issues of type design and lettering, Lettering & Type features the context and creativity that shape letters and make them interesting. 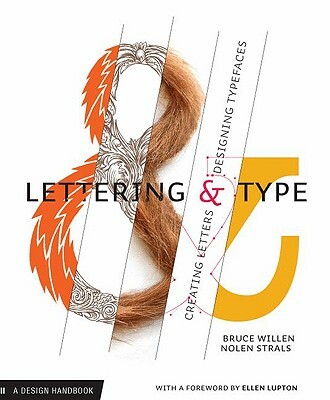 Authors and designers Bruce Willen and Nolen Strals examine classic design examples as well as exciting contemporary lettering of all stripes—from editorial illustrations to concert posters to radical conceptual alphabets. Lettering & Type is ideal for anyone looking to move beyond existing typography and fonts to create, explore, and use original or customized letterforms. This latest addition to our best-selling Design Briefs seriesfeatures a foreword by Ellen Lupton and hundreds of images and examples of work by historical and contemporary designers, artists, and illustrators, including Marian Bantjes, Stefan Sagmeister, Matthew Carter, Christoph Niemann, Steve Powers (ESPO), House Industries, Christian Schwartz, Margaret Kilgallen, James Victore, Abbott Miller, Sibylle Hagmann, Ed Fella, and many more. Throughout the book interviews with type designers, artists, and graphic designers provide real-world perspective from contemporary practitioners. For nearly a decade, Bruce Willen and Nolen Strals have collaborated under the label Post Typography on creative projects encompassing graphic design, illustration, typography, lettering, and printmaking with additional forays into art, apparel, music, curatorial work, design theory, and vandalism. They both live in Baltimore.